The NEMESIS is a life-style blocker designed for large residential properties or less-intensive commercial use. At only 272 kg, the mower is light and quick thanks to the extensive use of light-weight aluminium, and high-strength steel. You have the choice of the standard 48 inch deck, or MONSTER MODE with a 52 inch deck will have you sailing along at up to 13 km/hr. Aerospace inspired trailing-link, front-caster suspension and double-density seat foam make for a very smooth ride. Two choices of batteries are available depending on the size of your property or work load. The LEM4880 Green Lithium Battery will provide plenty of power for mowing around one hectare (about 1.5 hours) and the LEM48140 boosts productivity to around two hectares (2.5 hours). Operating at 76db, your neighbours will wonder what that quiet green thing is you are whipping around on in the middle of night – if you choose to mow with the optional LED floodlights, of course. The machine simply is that quiet. The solar panel canopy SAM provides extra operating time and also keeps the sun off. There is also the option of attaching some solar panels to your garage or workshop and charging up for free. 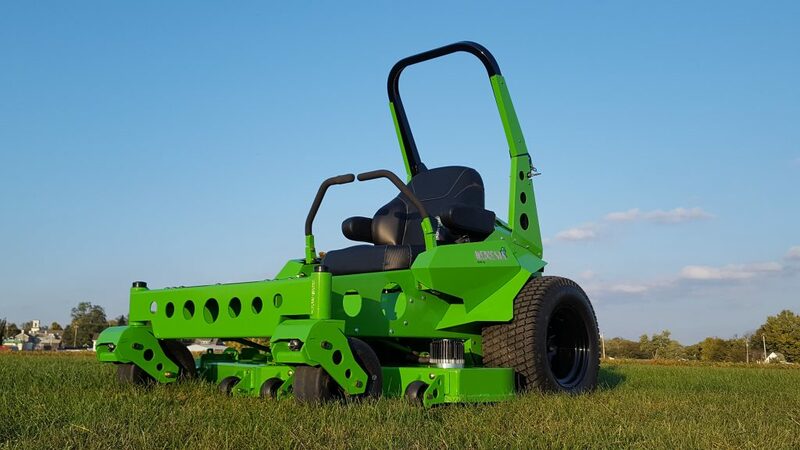 The NEMISIS is the latest mower in the Mean Green lineup and is simply a cool machine to operate.